"This is one of the fluffier gluten-free cakes I have ever had. We discovered it by accident when experimenting. Works good to turn cake over and ice for parties or events. Makes a good half-soccer ball cake." Generously butter the inside of a large, microwave-safe cereal bowl. Whisk eggs, sugar, baking powder, quinoa flour, sorghum flour, millet flour, olive oil, peanut butter, butter, cinnamon, and vanilla extract together in the bowl until flour is evenly mixed into the batter. Cook in microwave until cake is cooked through, 1 1/2 to 2 minutes. Yogurt can be substituted for peanut butter. 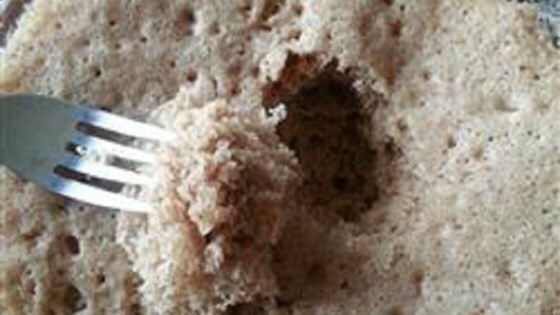 Peanut butter and yogurt are optional, use a little more for moister cake and a little less for dryer cake. Other ingredients can be substituted for flavor.